The REC-B6510 was specifically designed for use in single-handed operation in overhead applications such as cable trays. This allows one hand to control the work while the other hand is free to operate the tool. 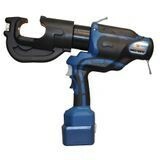 It also eliminates the cumbersome hoses and larger, heavier tools traditionally used in overhead work. 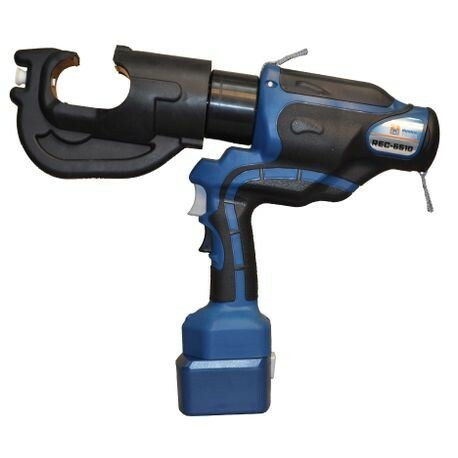 ; The REC-B6510 has the same jaw opening as our REC-3510 battery operated 12-ton compression tool. The opening is 1.65” which will accept mid-span copper and aluminum splices and lugs up to 750 MCM Cu/Al. This tool accepts all “U” type dies available on the market. ; Portability and handling are made easier because the REC-B6510 system is self- contained and compact. The new rapid advance system reduces tool run time, giving you more crimp cycles per battery charge. A built-in, pre-set 10,000 psi bypass cartridge will audibly “bypass” when the optimal pressure is achieved.